Becoming a full-time entrepreneur can look glamorous from the outside. Who doesnât want to chase their dreams, be their own boss, and do what they love? But the truth is that entrepreneurship is often a slog, with no regular hours, no job security, and very little pay. â¢Dipali Patwa, a designer and mom whose side project designing and selling infant clothing is now a sensation. â¢A group of friends who met at a 6am Bible study class and went on to start a brewery that now generates millions in sales . A successful 10% Entrepreneur himself, McGinnis explains the multiple paths you can follow to invest your cash, time, and expertise in a start-upâincluding as a founder, angel, adviser, or aficionado. 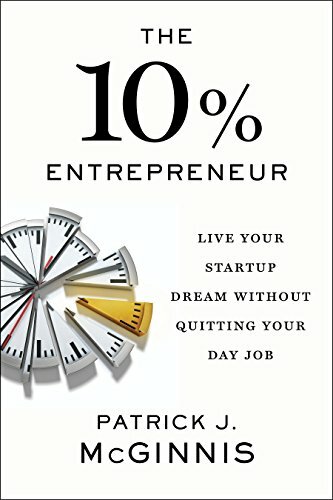 Most importantly, you donât have to have millions in disposable income to become a 10% Entrepreneur. When you put McGinnisâs 10% principles into action, youâll quickly start racking up small wins, then watch as they snowball into your new (and far more entrepreneurial) life.